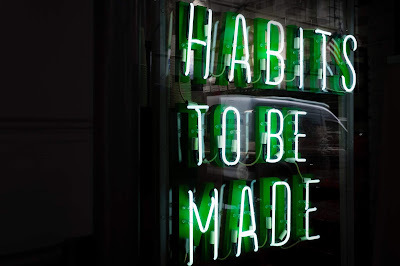 Habits - whether it's blogging regularly (oops), keeping the kitchen clean, exercising daily, or something else - are only habits as long as you do them. 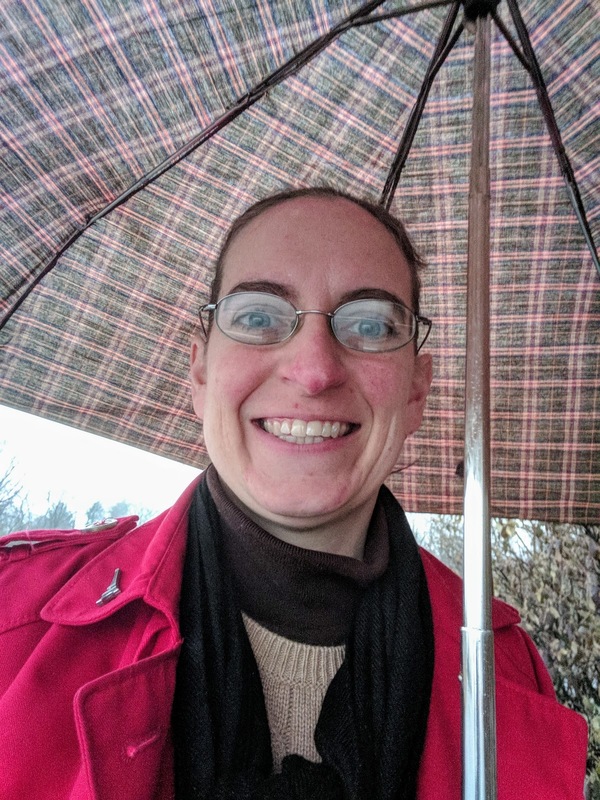 Christmas knocked me off my walking game, then there were cold, snowy days, cancelled school days, and days when I just didn't feel like doing it - so I didn't. But that doesn't mean I should give up! 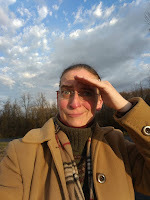 Yesterday it was sunny and warmer, so I walked. 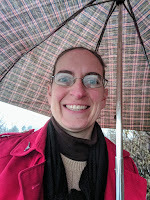 Today it was warmer but drizzling rain, so I grabbed the umbrella and walked! I still have about 10 lbs. that I'd like to lose, but if I want that to happen, I have to be consistent in my movement and eating habits. 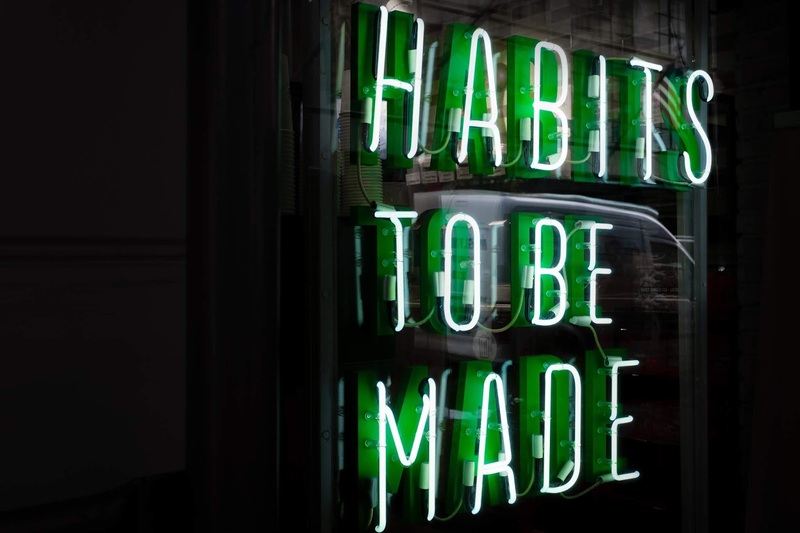 The weight doesn't just magically melt off (just as my kitchen doesn't magically clean itself, nor do my clothes jump in the washing machine and present themselves, folded KonMari-style, in my drawer) - it all takes WORK and SELF-DISCIPLINE. Far too often we fall into the trap of thinking that what we want should come easily. Obedient kids should happen naturally rather than requiring consistent parenting and boundaries. Money should be in the savings account without needing to work more or buy less. Pants should feel looser without giving up Reese's Peanut Butter Cups. Well, bad news for us - it all takes work. It all requires us to die to self in some way, setting aside preconceived notions, assumptions, and expectations. We have to be the parent, whether we feel like the adult or not. We have to set up the automatic transfer to savings and avoid Amazon if we want to see that balance grow. And we have to make a choice in what we eat and how we spend our time because there is no magic, side-affect-free pill to make us as skinny as we were twenty years ago. It's time we learn how to avoid the "quick fix" mentality and develop our Fruits a little bit more (you know the ones: love, joy, peace, patience, kindness, goodness, faithfulness, gentleness, and self-control). When the kids get under my skin, I'm praying for more love and patience as I dive in to figure out what's going on with them that's causing them to act out. As we set financial goals for our year, I'm making the choice to avoid certain stores and shop grocery sales and leave my wants in the Amazon cart. And if I want to see that goal number on the scale, then I must choose to do more of what I did this morning, rain or shine. During my battle with fear and anxiety, one of the ways I learned how to fight back was by pouring over God's Word, specifically the book of Psalms. There would be days when I would literally spend hours reading through them, or repeating the promise of one psalm over and over. Psalm 46 was one of those that became a "go to" for me in times of panic. There were definitely days when it felt like the earth was giving way beneath my feet, and the waters were rising over my head, but then the reminder to "be still" and the knowledge that I could cling to - I could KNOW that He was God. I would not fall. Jesus was there. There were moments when I would repeatedly whisper to myself, "I KNOW that the LORD is God, I KNOW that the LORD is God...". Although it's been a long time since my last attack, I have continued to rely on the Psalms as we have walked through the fire of our adoption. Taking on five kids between the ages of 4-12 was no picnic, and that first year was filled with anger and tears, crying out to God for His help, begging Him not to let me sink in self-pity, looking back, much like the Israelites longing for the "better" days of Egyptian slavery. Year two was definitely better than year one, and as we're working on year three, the difference is striking. God has done so much in the lives of the children He has placed in our care, and I can only sit back in awe and look forward with anticipation of all that He will do with them. Last week, the Hubs sent me an email with a YouTube link and the comment, "This is good stuff." I saw it come into my inbox earlier in the day, but didn't have time to click through and watch at the time. That evening, after the school pick up, homework help, rush of dinner, and trek to Awana to drop them all off, I pulled in behind our house and knew I had a few minutes before the Hubs arrived with our Awana Date Night Takeout. I plugged my phone into the car's audio system and clicked the link to the video you see below. Within seconds of it starting, I felt my eyes welling up with tears and my heart was overwhelmed with awe for our God. Worship is very personal, and people are led to that quiet place in different ways, but I wanted to share this with you in the hopes that it will be an encouragement for the person who needs to see it today. May you be reminded that the Mighty One of Israel is walking by your side. Anxiety can take a hike. The Lord of Hosts is with us, leading us in the fire. You may recall that my anxiety took me by surprise, having never experienced anything like it before. You may also remember that after meeting with my physician to make sure there wasn't anything physically wrong, I began taking steps towards recovery that included spending many hours in prayer, digging into God's Word, and - eventually - reading a whole bunch of A.W. Tozer. If you don't know who A.W. 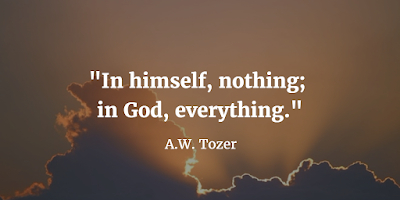 Tozer is, you can click here to read a short bio of his life, but for me it's not about Tozer - the great writer, but Tozer - the man who points people to God. God placed his work in my life at a time when I was unknowingly seeking a deeper relationship with Jesus, and his words led me down a path that I had been missing. In November of 2014, the Hubs started saying to me, "I've been listening to this audio book that I got for free. It's by a guy named Tozer, and I think you might really like it." Now, the Hubs never recommends books to me, and in general we have different tastes in the types of literature that we read, so I ignored his suggestion. But he kept bringing it up (which was also unusual), until I finally gave in and ordered the paperback version of The Attributes of God (Vol. 1). As my panic worsened in December, I found myself unable to do most of the activities that I had always used to relax and escape from the stresses and pressures of life - watching (Christmas) movies, reading mysteries, scrolling through Pinterest. Even sitting in church became a nightmare! I found myself battling against full blown panic attacks while those around me belted out Christmas hymns, and I became an expert at bolting out the door as soon as the pastor closed his final prayer. Everything that had previously brought me pleasure now incited overwhelming fear. Everything, that is, except God's Word and Tozer's book. As we passed through the Christmas season, I spent my days curled up in a chair in our living room with my Bible, The Attributes of God, and a notebook. In general I am a fast reader, but it took me a month to read through The Attributes because I kept bursting into tears, overwhelmed by my small view of God. My prayer and gratitude journals during that time are filled with confessions of my own sense of control, my cry to God to be my stronghold, my lists of anxious thoughts and irrational fears. It was during this season that God stripped me of everything that I had unknowingly come to rely on instead of Him, the biggest shock coming when I realized that I had put my husband in the place of God in my life - which I confessed to my Father and asked the Hubs to forgive. As much as he wanted to help, in the midst of my panic attacks, my sweet husband could do nothing to comfort me. His embrace did not make me feel safe, his prayers did not calm my soul, his rational explanation of my physical response did nothing to alleviate my anxiety. When I saw my choice to look to him for my security rather than rely upon God, I was a sobbing, crumpled mess, begging God to forgive my pride and arrogance, my ignorance and foolishness, and to take His rightful place back at the core of my heart. And, my friends, He did. In His awesome faithfulness, He began to take my brokenness and remake me. It took time - months, in fact - but God allowed me to see the bigger picture. I stood in awe of His might and power, of His authority and His love. I realized that I had unwittingly put God in a small, convenient box of my own making, one that fit my view of Him. Of course He was God, and yes, He played a large role in my life, but I was still holding onto control of other segments. Or, rather, I held onto the illusion of control. As God did His work in me, I slowly realized that I controlled nothing at all. From something as simple as going out to dinner (and being paralyzed by fear in the parking lot) to relinquishing control on the adoption process that we were in the midst of, God reminded me that my job is to follow His lead, not to attempt to lead Him where I wanted to go. Letting go of control was hard - and can still be a challenge - but it was necessary to move to the next step of recovery. It's been almost five years since my first panic attack, and I can't remember how long since my last one. Months, at least. On the rare occasion that panic comes for a visit, it usually happens when I have strayed away from fellowship with my Father. When the days are long and the busyness overwhelms the introverted me, when I've set my eyes on my own plans, looking inward rather than upward, then the squeeze of panic begins. Sometimes it manifests itself through unexpected tears (and I'm not a crier, so I hate this, of course! ), sometimes it's just unexplained fear. But now I am armed with an arsenal of Scripture, a group of praying friends who are just a text away, and the knowledge that I can let go - must let go, in fact - so that God will increase in my life. Because when He increases, there is no room for the self-focus that drives fear. Yes, I did it without a counselor, yes, I did it without medication, but no, I did not do it at all - I surrendered because I could do nothing else, and God met me with open arms. I don't know your story - just as you really only have a limited understanding of mine - but I do know our God, and I know what He is fully capable of doing, as long as you are willing to let go and trust Him completely. What I learned as a result of my experience is that God is sufficient. He is, in fact, more than enough. It is not God who must become more powerful - He already is all-powerful - but I who must acknowledge His power. Fear and panic are not choices - I know this well enough after all the times when I tried to rationalize my way out of them - but surrendering to God in the midst of it, is. I'm thankful for the way God used A.W. Tozer's book on God's attributes to show me my limiting view of Him. I'm grateful for every moment of panic, every fear-filled day, and every gut-wrenching sob that I experienced, because without them, I would still be comfortable in my complacency. God can, and does, use the difficulties of this life to draw us back to where we can best see Him, and for that there are not enough words of thanks. It's been a long, busy week. I'm a mentally and physically drained introvert. I've got a long list of work-related items to knock out today, not to mention a full kitchen sink, messy counters, and the pile of Christmas lights that are still sitting on our bedroom floor because I just haven't managed to get them downstairs into their storage box. This is life. Life is messy, it's busy, it's filled with crazy chaos at times. While standing at the free (because our local martial arts studio loves parents!) coffee center at taekwondo last night, waiting to get a small cup of bean juice, I stepped out of character and started talking with the other mother who was getting coffee ahead of me. We laughed about the fact that we wake up in the mornings and our first thought is "how long until bedtime?" Every day this week has been hijacked by appointments (planned and unplanned), errands, and life. I am firmly convinced that God created coffee beans for parents. Step aside perky teenagers and college students...Mama needs her coffee! This morning over on Facebook, I've been staring at the blinking cursor after the words "January 18: #iamthankful..." for far too long, my mind drawing a blank. Sometimes it's hard to focus on gratitude in the middle of life...which is exactly why I practice the habit of intentional daily gratitude. One of our girls has put down, "thankful for the chips you packed in my lunch" every day this week for one of her 'thankful for' items. And while I want her to start thinking BEYOND food for her gratitude list, this week I have had to chuckle because sometimes the "bag of chips" is all you can think of -- and you truly are thankful for them! On Wednesday morning, I was picking out bananas at the grocery store and looked up to see my childhood friend who tragically lost her husband one year ago (and gave birth to their son just hours before the funeral). She was picking out flowers and a balloon to place on his grave. I have watched her over the last year as she has worked through the grief of widowhood and the joy of being a new mom, sharing both the sense of loss and the wonder of new life through her Facebook posts and her blog. Seeing her in the store on the one year anniversary of her husband's death was a stark reminder to me not to take any of these crazy days for granted. Last night, during all of our running around in the car, I told the kids that I was going to play the audio Bible that I'd been listening to. Although it was for me (and my sanity) and not specifically for them, as the narrator began to read out of 2 Thessalonians and then 1 Timothy, the car became calm and peaceful. As the last words of Paul to Timothy ebbed away, I heard my 7 year old son say quietly - from his seat in the very back of the car - "That was good." Yes, God's Words are always good. They are edifying and thought-provoking. They remind me that this life (and the chaos that often comes with it) are just temporary, and we are to make the most of every opportunity that we are given. Life is a vapor...live it for the Glory of God. And in everything, give thanks. We're two weeks into the new year, and I'm two books closer to reaching my 2019 goal of 50 books. Over the weekend I finished reading A Matter of Loyalty (A Very English Mystery Book 3), and Peril in Paris (Taylor and Rose Secret Agents). The first was the finale (sadly) of a series that I stumbled onto in mid-2018 and began listening to as an audio book (my first!) while walking this autumn. I enjoyed the narrator and his myriad of voices, and the story was intriguing. Nothing earth shattering, but an unusual mystery style, set in post-war England, and a good way to fill 20 minutes a day as I walked. You can read a slightly different review of it on Goodreads, if you're so inclined. The second was one that - truth be told - I downloaded because it had "Paris" in the title, plus I had enjoyed some of the authors earlier work. These are definitely written for an audience of 9-12 year old girls who are not yet reading through the lens of skepticism that adults have. Of course the British Secret Service are relying on 17 year old girls to save the lives of royalty and solve the murder of a double agent in Paris! Think some kind of strangely modern Nancy Drew (young girls running their own, ethnically diverse detective agency), but set in pre-WWI era Europe, and you've got the idea. That being said, it's exactly the type of series I would have loved when I was the age of the target audience, and I read these - in part - because I'm always looking for options that one or more of our girls would enjoy and get sucked into. For my other thoughts, read the Goodreads review. I have several books going at the moment, both physical and electronic. I'm taking full advantage of the free Prime Lending Library (up to 10 books at a time), and am currently involved (off and on) with The Widow Clicquot and The Bletchley Girls as a result of that. On my actual nightstand, you'll find an old fallback (Poirot) in Mrs. McGinty's Dead, and a book that I requested (and received) from the Hubs for Christmas, World War One: A Very Peculiar History - which has been fascinating so far. There are so many books on my nightstand and queued up in my Kindle, and so little time to read these days, but where there's a will, there's a way, right? Of course, right! Bookworms unite.